I am replacing nails that were used to secure the boards on my deck. The nail line is directly under the bottom 2x4 of the side rail with barely 4 inches of clearance. Viola, this drill with a stubby bit and a 2 1/2 inch deck screw makes a difficult job easy. It should have 2 speeds switch. As the Contractor, doing kitchen cabinet installation and refacing, I bought this Angle Drill as a subsidiary tool for hard to reach places and narrow opening door installation. This Drill is good to drill the holes, but it's very hard to use it as the screw driver, since it is very hard to control the driving speed. 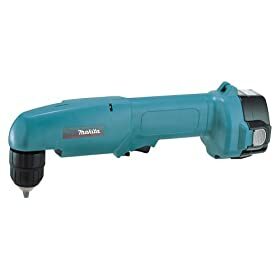 The Makita manufacturer should add 2-speed switch to this Drill-Driver as Dewalt did.